When we hear the name “Buffalo Bill,” the first person we think of is Buffalo Bill Cody, the famed frontier scout and Wild West showman. 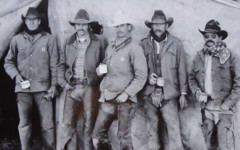 However, there was another Buffalo Bill who lived an adventurous life out West, several years before Col. Cody acquired his Buffalo Bill moniker. He was one of the most flamboyant figures to roam the prairies around Wichita, Kansas, yet perhaps the least known. William Mathewson—referred to as “The Other Buffalo Bill” by locals and serious Old West scholars—was an explorer, hunter, fur trader, Indian scout and fighter who helped to clear the path for Western settlers. Born January 1, 1830, in Triangle, Boone County, New York, William Mathewson realized at a very young age that he was not cut out to work on his family’s farm. By the time he was 18 he had left home, beginning his life of adventure. His list of accomplishments and adventures fills a volume, but here’s a brief rundown of some of them. For saving the Overland Transportation Company’s wagon train of 155 men and 147 wagons, William Mathewson was awarded this finely etched floral vine embellished, French-fitted, Tiffany silver and gilded-cased set of 1861 Navy Colts. 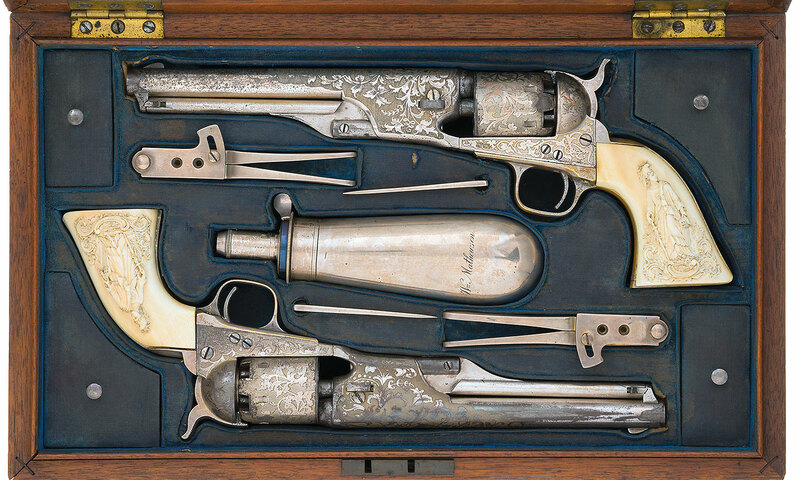 Silver-plated accessories include a pair of Colt patent dual cavity bullet molds, two L-shaped combination tools, and a “Wm Mathewson” inscribed James Dixon & Sons powder flask. Starting in 1849, Mathewson traded along the Santa Fe Trail, and by 1852 was involved in Western hunting expeditions, including one trek in the Rocky Mountains with famed guide Kit Carson. He then went to work for the Bent-St. Vrain Trading Post, where he traded with Sioux, Arapahoe, Cheyenne, Kiowa, Comanche and Apache Indians. 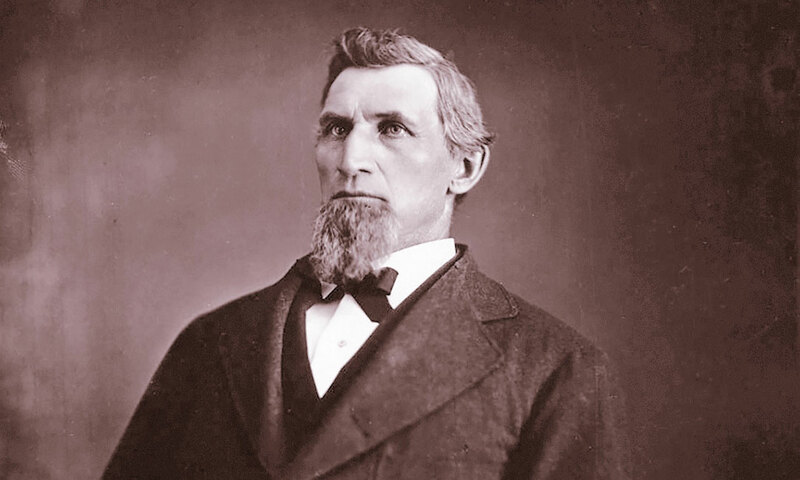 By 1858, he and a partner established their own trading posts in central Kansas. During the winter of 1860-’61 he first earned the nickname “Buffalo Bill” for having saved the many settlers in the region from starvation, due to a severe drought that had ruined their crops. 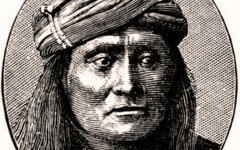 It’s reported that he killed enough buffalo for the settlers and refused payment for his services or the meat. 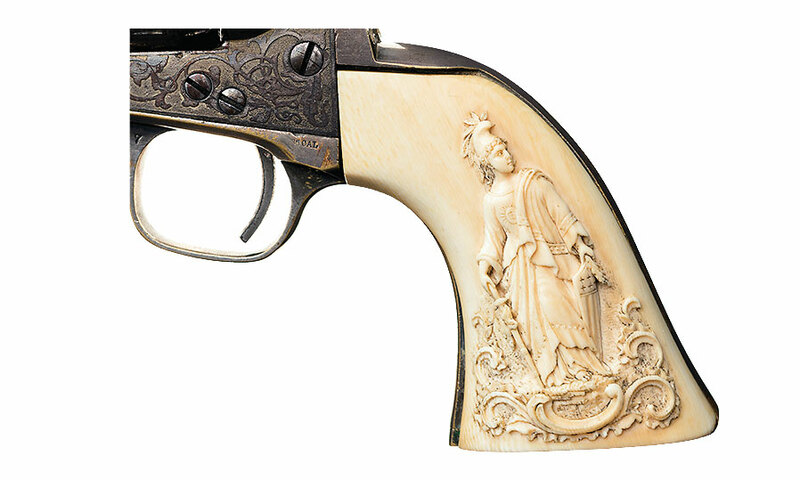 The exquisitely carved ivory stocks on these ’61 Navy Colts are adorned in high relief images displaying an American bald eagle and shield/scrolled motif on the right side of each revolver, while the left side of each bears a beautiful Columbia and shield design. In 1861, Mathewson beat the powerful Kiowa chief Satanta (White Bear) in a bare knuckles fight after the chief threatened to kill him. Mathewson then chased Satanta’s small band off from his post at the point of his revolver! 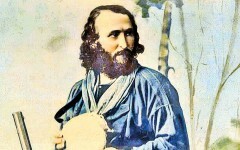 He acquired a new moniker from the Indians: “Sinpah Zilbah” (Long Bearded Dangerous White Man). When the chief returned the following year, he made peace with Mathewson and presented him with three of his finest ponies. 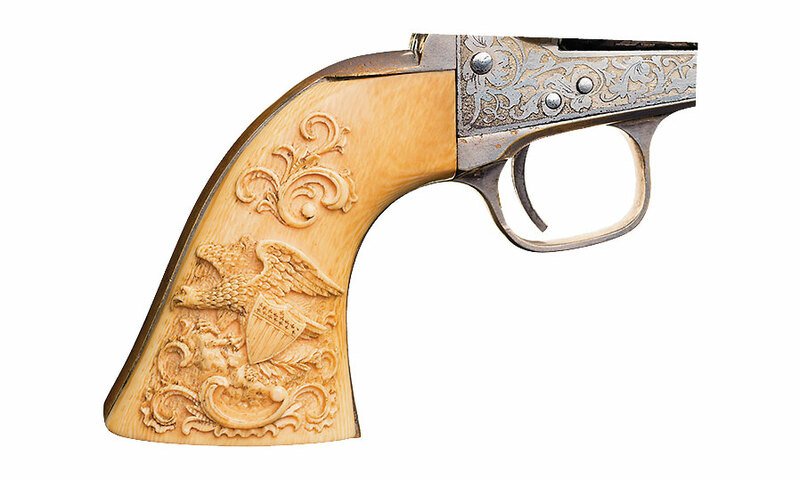 The handsome six-shooters have fared well over the years, retaining most of their original finish, despite the fading of the gilt inlays. The delicate floral vine etching is sharp and clear, and the tusk ivory grips have mellowed to an attractive hue. Many collectors consider the .36 caliber 1861 Navy Colt the sleekest design of Colt’s percussion revolvers. Three years later, Mathewson and five comrades held off an Indian attack at his Cow Creek Crossing trading post for several days. Armed with a Sharps rifle and six Colt revolvers, he galloped out alone to help a besieged wagon train of government supplies. He charged headlong into the warriors with guns blazing, broke through to the wagons he had been expecting and broke open the crates of repeating rifles and ammunition (the teamsters were unaware of the cargo, as it had been disguised), turning the tide of the battle and routing the Indians. 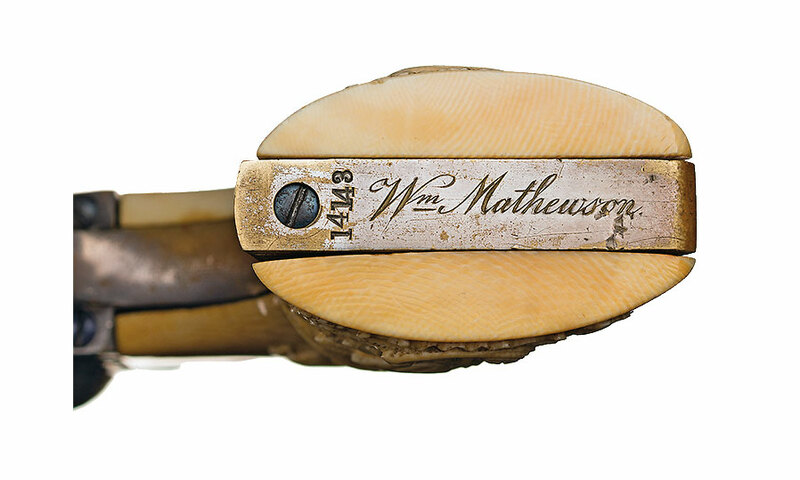 The silver-plated butts of William Mathewson’s ’61 Navy Colts are inscribed with his name, along with factory-stamped serial numbers. 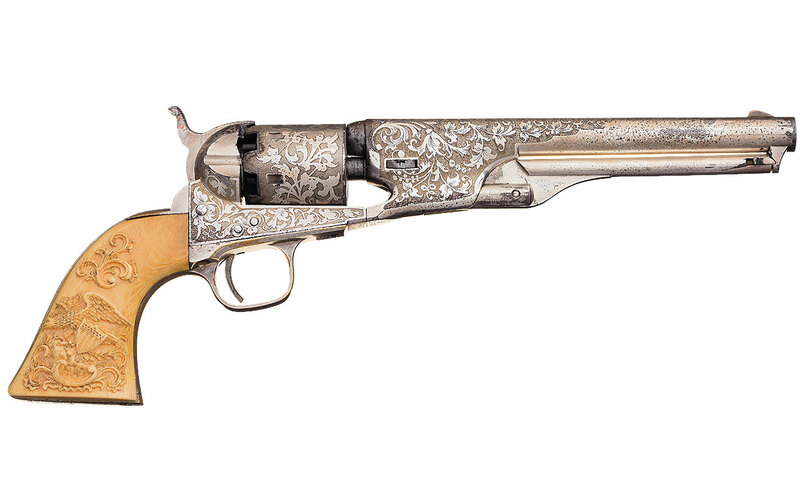 These beautiful and historic frontier six-shooters have retained much of their silver finish, but their gilt inlays have faded over time. Mathewson also served as a scout during the Civil War, and between 1865 and 1873, he personally rescued 54 settlers from Indian captivity, later becoming a negotiator between the whites and the Indians, helping to pave the way for future settlers in Kansas. He was one of Wichita, Kansas’s founders, helped create the Wichita Savings Bank, where he served as president, and was Wichita’s police commissioner from 1889 until 1891. His 1868 homestead, which he profitably worked until his death in 1916, is now situated in the heart of the city. Arbuckles The coffee that won the West. 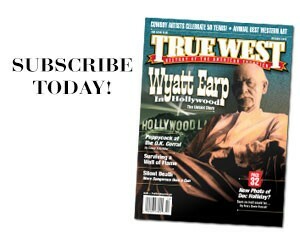 The Tombstone Collector Jim Melikian is True West’s “Best Western History Collector” of the year.